It should be 320 CBR. EDIT: Actually it's VBR, but sounds better in the treble part than the OGG one, and there's no audible difference between this and the 320 CBR mp3 version, aside from the significantly smaller size. Last edited by Avalanche._; 02-06-2016, 08:26 AM. I add the MP3 link to my previous post. To make things clear, I am NOT talking about something like the mp3 player in UT2004. I found that, to be blunt, useless since you could just as well run Winamp in the background. I am talking about an application that replaces the default track of a level, like the way it was done in Tekken Tag Tournament 2. It was awesome: didn't like a song? Just replace it. You could even download the soundtrack of all other Tekken games and replace the tracks with them. Unfortunately my knowledge about coding is on the Jon Snow-level so I'll have to rely on somebody else to pick this up. Otherwise I would have already coded this myself. (or at least attempted to). 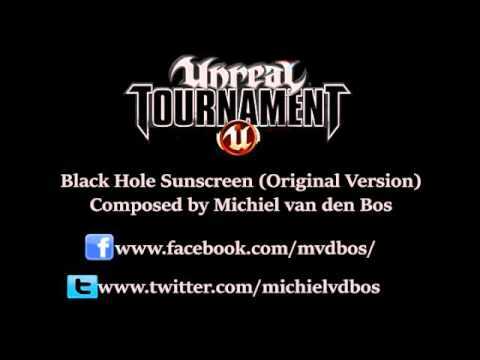 Michiel uploaded the original version of Black Hole Sunscreen to YouTube. As with all of Michiel's tracks, I've always thought the juxtaposition of crazy violence with soothing sounds was what made the UT Soundtrack so amazing. Those pads in Black Hole Sunscreen! TSeals, I think that's dead on! Not just violence but the mixing of kick *** high-energy music with relaxing "soothing" background notes is just awesome. They are contrasting music types and when put together at the same time, they only emphasize each other. I would take UT3 remix of Foregone Destruction for the new UT everyday. Not gonna happen, I know, but that remix was outstanding and really memorable alongside the original. Same goes for Skyward Fire. Why not https://forums.unrealtournament.com/...light=heimdall ? It's amazing in my opinion. If you want to contribute you can do track for free only way. Epic is not interested in paying, this is free game by community and you are contributing by giving epic rights to use your track for free in their game. Faceless sounds fantastic, when can we hear the rest? Very promising, thanks for sharing. So, looking into this, it doesn't look like a main theme has been chosen. Are you guys looking for a new original piece or a remake of the original UT99 theme or what? And is this even the right place to ask stuff like that, has some criteria for the theme been posted somewhere else on this forum already?